Mount Road or Anna Salai is no longer the stretch it once used to be, even compared to the early 1980s when I arrived in Madras. Then, the old Spencer's building was still there and there was a charm to walking around aimlesly, window shopping, trooping into various shops on the stretch, or just walking past, watching life go by. The Safire complex was very much alive. I remember watching a film in Blue Diamond one morning, just to get a feel of what it all was about. Yes, I did go in alone! And there were outings late at night too, when I was an officer in the insurance industry. Those days, we would have kababs and ice creams at Tic Tic, and relish the variety of paans that the Khan Sahib outside prepared, and then head to Safire for the night show. Or sometimes just walk to Cakes & Bakes for some delicious pastry. Good old memories. Today, not many talk about going to Mount Road to spend an afternoon or evening. There is the new-look modern three-phase Spencer's Plaza, but it isn't what it used to be. With shopping malls coming up all over town, Mount Road has lost its importance as a shopping destination. When I drive past the Gwalior showroom or Roshanlal's, I sometimes wonder whether they still do good business. Perhaps they have a dedicated clientele. But most are not as lucky. Business has dwindled along the stretch and that has a lot to do with the four-lane traffic system that came into being a few years ago. It's another matter that now hardly anybody follows rules meant to be followed on the stretch; it's the law of the jungle - might is right. If Mount Road was different to someone like me, I can imagine what old-timers will have to say. Jaffar's ice creams and Buhari's would certainly find mention in their list. 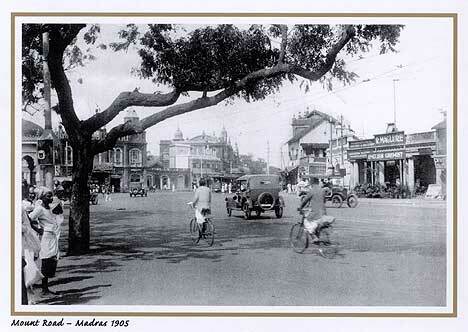 Well, here's how Mount Road looked like in the early part of the 20th century. Sigh!